With each Auto Scaling group, you control when it adds instances (referred to as scaling out) or removes instances (referred to as scaling in) from your network architecture. You can scale the size of your group manually by attaching and detaching instances, or you can automate the process through the use of a scaling policy. To specify which instances to terminate first during scale in, configure a termination policy for the Auto Scaling group. You can also optionally use instance protection to prevent specific instances from being terminated during automatic scale in. 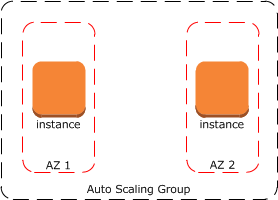 For instances in an Auto Scaling group, use Amazon EC2 Auto Scaling features to protect an instance if a scale in occurs instead of Amazon EC2 termination protection. For Auto Scaling Groups with Multiple Instance Types and Purchase Options, the scale-in action respects the percentages set for On-Demand and Spot Instances and the On-Demand base amount. When the group scales in, the Auto Scaling group first identifies which of these two types of instances it will terminate and then chooses the Availability Zone with the most instances of that type to apply the default or customized termination policy to. This section describes the default termination policy used by an Auto Scaling group when a scale-in event occurs. The default termination policy is designed to help ensure that your instances span Availability Zones evenly for high availability. The default policy is kept generic and flexible to cover a range of scenarios. Determine which Availability Zone(s) have the most instances and at least one instance that is not protected from scale in. If there are multiple unprotected instances to choose from in the Availability Zone(s) with the most instances, an instance is selected for termination based on the following criteria (applied in the order shown). Determine which instance to terminate so as to align the remaining instances to the allocation strategy for the On-Demand or Spot Instance that is terminating, your current selection of instance types, and distribution across your N lowest priced Spot pools. If there is one such instance, terminate it. Otherwise, apply the next condition. Determine whether any of these instances use the oldest launch template. (The exception is if the group originally used a launch configuration. Amazon EC2 Auto Scaling terminates instances that use a launch configuration before instances with the oldest launch template.) If there is one such instance, terminate it. Determine whether any of these instances use the oldest launch configuration. If there is one such instance, terminate it. If there are multiple unprotected instances to terminate after applying all of the above criteria, determine which instances are closest to the next billing hour. (This helps you maximize the use of your instances that have an hourly charge.) If there is one such instance, terminate it. Maximizing usage to the hour is currently applicable to instances running Microsoft Windows or Linux distributions that have an hourly charge. If your Auto Scaling group uses Amazon Linux or Ubuntu, your EC2 usage is billed in one-second increments. For more information about per-second billing, see Amazon EC2 Pricing. If there are multiple unprotected instances closest to the next billing hour, choose one of these instances at random. Consider an Auto Scaling group that uses a launch configuration. It has one instance type, two Availability Zones, a desired capacity of two instances, and scaling policies that increase and decrease the number of instances by 1 when certain thresholds are met. The two instances in this group are distributed as follows. When the threshold for the scale-out policy is met, the policy takes effect and the Auto Scaling group launches a new instance. The Auto Scaling group now has three instances, distributed as follows. When the threshold for the scale-in policy is met, the policy takes effect and the Auto Scaling group terminates one of the instances. If you did not assign a specific termination policy to the group, it uses the default termination policy. It selects the Availability Zone with two instances, and terminates the instance launched from the oldest launch configuration. If the instances were launched from the same launch configuration, the Auto Scaling group selects the instance that is closest to the next billing hour and terminates it. For more information about high availability with Amazon EC2 Auto Scaling, see Distributing Instances Across Availability Zones. The default termination policy assigned to an Auto Scaling group is typically sufficient for most situations. However, you have the option of replacing the default policy with a customized one. When you customize the termination policy, if one Availability Zone has more instances than the other Availability Zones that are used by the group, your termination policy is applied to the instances from the imbalanced Availability Zone. If the Availability Zones used by the group are balanced, the termination policy is applied across all of the Availability Zones for the group. OldestInstance. Terminate the oldest instance in the group. This option is useful when you're upgrading the instances in the Auto Scaling group to a new EC2 instance type. You can gradually replace instances of the old type with instances of the new type. NewestInstance. Terminate the newest instance in the group. This policy is useful when you're testing a new launch configuration but don't want to keep it in production. OldestLaunchConfiguration. Terminate instances that have the oldest launch configuration. This policy is useful when you're updating a group and phasing out the instances from a previous configuration. ClosestToNextInstanceHour. Terminate instances that are closest to the next billing hour. This policy helps you maximize the use of your instances and manage your Amazon EC2 usage costs. Default. Terminate instances according to the default termination policy. This policy is useful when you have more than one scaling policy for the group. OldestLaunchTemplate. Terminate instances that have the oldest launch template: first the non-current launch template followed by the oldest version of the current launch template. This policy is useful when you're updating a group and phasing out the instances from a previous configuration. AllocationStrategy. Terminate instances in the Auto Scaling group to align the remaining instances to the allocation strategy for the type of instance (either a Spot Instance or an On-Demand Instance) that is terminating. This policy is useful when your preferred instance types have changed. You can gradually rebalance the distribution of Spot Instances across your N lowest priced Spot pools. You can also gradually replace On-Demand Instances of a lower priority type with On-Demand Instances of a higher priority type. On the navigation pane, choose Auto Scaling Groups. On the Details tab, locate Termination Policies. Choose one or more termination policies. If you choose multiple policies, list them in the order in which they should apply. If you use the Default policy, make it the last one in the list. aws autoscaling update-auto-scaling-group --auto-scaling-group-name my-asg --termination-policies "OldestLaunchConfiguration" "ClosestToNextInstanceHour"
If you use the Default termination policy, make it the last one in the list of termination policies. For example, --termination-policies "OldestLaunchConfiguration" "Default". To control whether an Auto Scaling group can terminate a particular instance when scaling in, use instance protection. You can enable the instance protection setting on an Auto Scaling group or an individual Auto Scaling instance. 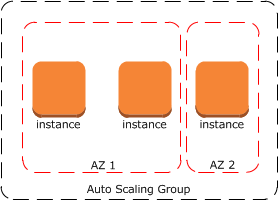 When the Auto Scaling group launches an instance, it inherits the instance protection setting of the Auto Scaling group. You can change the instance protection setting for an Auto Scaling group or an Auto Scaling instance at any time. Instance protection starts when the instance state is InService. If you detach an instance that is protected from termination, its instance protection setting is lost. When you attach the instance to the group again, it inherits the current instance protection setting of the group. If all instances in an Auto Scaling group are protected from termination during scale in, and a scale-in event occurs, its desired capacity is decremented. However, the Auto Scaling group can't terminate the required number of instances until their instance protection settings are disabled. Manual termination through the Amazon EC2 console, the terminate-instances command, or the TerminateInstances action. To protect Auto Scaling instances from manual termination, enable Amazon EC2 termination protection. For more information, see Enabling Termination Protection in the Amazon EC2 User Guide for Linux Instances. Health check replacement if the instance fails health checks. For more information, see Health Checks for Auto Scaling Instances. To prevent Amazon EC2 Auto Scaling from terminating unhealthy instances, suspend the ReplaceUnhealthy process. For more information, Suspending and Resuming Scaling Processes. Spot Instance interruptions. A Spot instance is terminated when capacity is no longer available or the Spot price exceeds your maximum price. You can enable instance protection when you create an Auto Scaling group. By default, instance protection is disabled. When you create the Auto Scaling group, on the Configure Auto Scaling group details page, under Advanced Details, select the Protect From Scale In option from Instance Protection. You can enable or disable the instance protection setting for an Auto Scaling group. For Instance Protection, select Protect From Scale In. By default, an instance gets its instance protection setting from its Auto Scaling group. However, you can enable or disable instance protection for an instance at any time. On the Instances tab, select the instance. To enable instance protection, choose Actions, Instance Protection, Set Scale In Protection. When prompted, choose Set Scale In Protection. To disable instance protection, choose Actions, Instance Protection, Remove Scale In Protection. When prompted, choose Remove Scale In Protection.